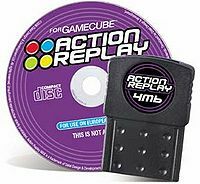 Action Replay, abbreviated AR, is the brand name of a series of cheating devices created by Datel, primarily used for changing the behavior of video games and hacks. 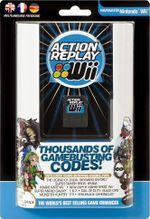 Currently, Action Replay is available for a number of consoles, including the Nintendo 64, Nintendo GameCube, Wii, and Nintendo 3DS, which feature games in the Super Smash Bros. series. Action Replay that works with an N64. 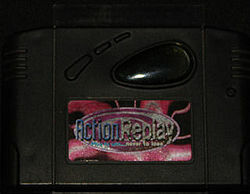 The version of Action Replay for the Nintendo 64 is inserted into the console's cartridge port. This version of Action Replay can be used to hack several features in Super Smash Bros., such as the debug menu. Action Replay for the GameCube. The version of Action Replay for the Nintendo GameCube attaches to the console's memory card slot, which, along with a separate disc, enables the player to access a debug menu, among other things. This version of Action Replay can be used to hack several features in Super Smash Bros. Melee, including the debug mode, unlocking characters, infinite jumps, strange attacks variations, moveswapping (known for being very glitchy), and "super" codes which make attacks very fast. It can also be used to play with non-playable characters or on unplayable stages. The GameCube debug menu has been used for TAS videos. Initially compatible with the Wii, current system updates of the Wii do not allow Action Replay for the GameCube to work; as a result, most TAS videos are now operated on either an original GameCube, or through the use of an emulator such as Dolphin. A version of Action Replay, called Powersaves, was made available for the Wii in 2010, but later system updates for the console rendered it inoperable. Prior to the introduction of an updated model in 2012, hacking Brawl generally involved the use of USB Gecko or other hacks or hacking utilities that could be loaded via the Smash Stack exploit. A Nintendo 3DS Version of Action Replay, called Action Replay Powersaves Pro, can be used cheats and hacks for Super Smash Bros. for Nintendo 3DS, though not currently to the same extent as Brawl or Melee. This page was last edited on September 23, 2016, at 00:26.